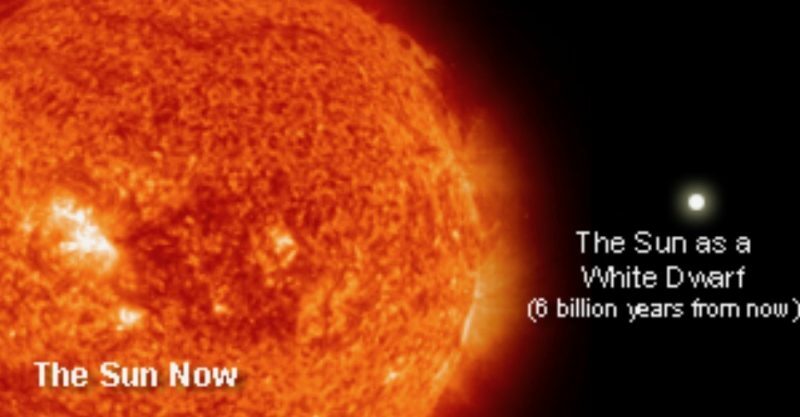 Tags: Astronomy ( 7,548 ), Astrophysics ( 4,683 ), Basic Research ( 10,441 ), Cosmology ( 4,874 ), EarthSky ( 82 ), U Manchester, What will happen when our sun dies? From University of Manchester via EarthSky: “What will happen when our sun dies? An example of a planetary nebula, Abell 39. Five billion years from now, our own sun will look like this, when it goes through the planetary nebula stage of star death. Image via WIYN/NOAO/NSF/University of Manchester. What does death mean, for the sun? It means our sun will run out of fuel in its interior. It’ll cease the internal thermonuclear reactions that enable stars to shine. It’ll swell into a red giant, whose outer layers will engulf Mercury and Venus and likely reach the Earth. Life on Earth will end. If the sun were more massive – estimates vary, but at least several times more massive – it would explode as a supernova. So … no supernova. But what? What happens next? An international team of astronomers recently used a new stellar data-model that predicts the life cycle of stars to answer this question. Their research is published in the peer-reviewed journal Nature Astronomy. It suggests that the sun is almost exactly the lowest mass star that – at the end of its life – produces a visible, though faint, planetary nebula. 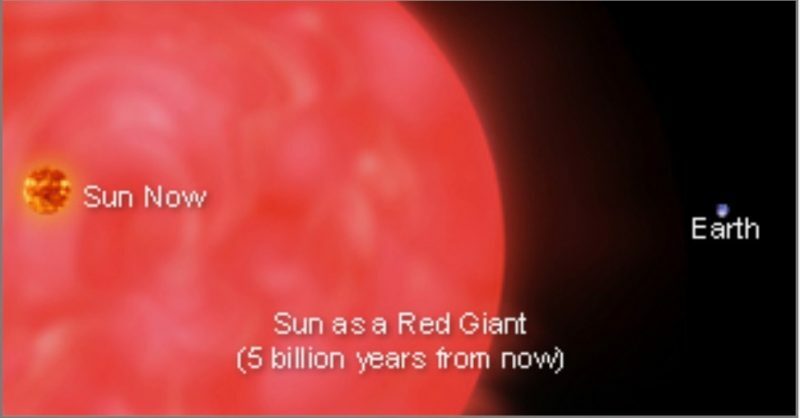 Artist’s concept of our sun as a red giant. Image via Chandra X-ray Observatory. The name planetary nebula has nothing to do with planets. It describes a massive sphere of luminous gas and dust, material sloughed off an aging star. In the 1780s, William Herschel called these spherical clouds planetary nebulae because, through his early telescope, planetary nebulae looked round, like the planets in our solar system. Astronomers already knew that 90 percent of all stars end their active lives as planetary nebulae. They were reasonably sure our sun would meet this fate. The key word here is visible. 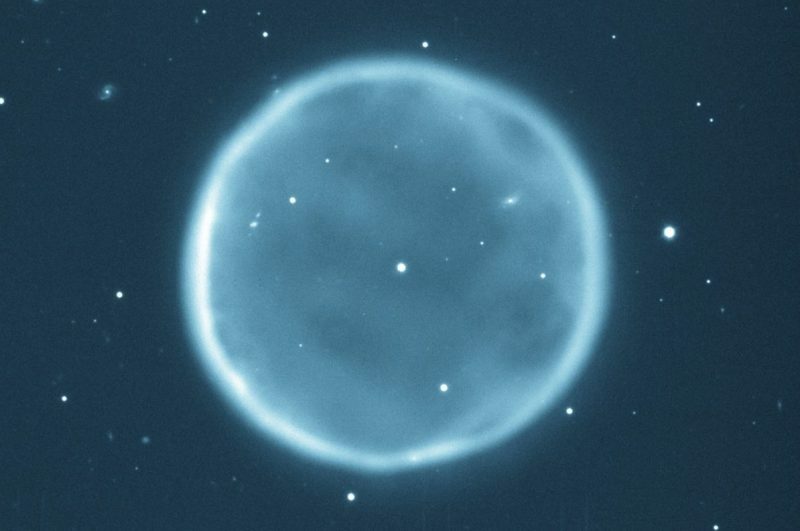 For years, scientists thought the sun has too low mass to create a visible planetary nebula. “When a star dies it ejects a mass of gas and dust – known as its envelope – into space. The envelope can be as much as half the star’s mass. This reveals the star’s core, which by this point in the star’s life is running out of fuel, eventually turning off and before finally dying. Will that be the fate of our sun? Will it – at the end of its life – become briefly visible to alien astronomers on planets millions of light-years away? These astronomers say no. They say their new models predict our sun at the end of its life, though forming a planetary nebula, will remain faint. By the way … what next? Eventually, the planetary nebula will disperse and fade. With its thermonuclear fuel gone, the sun will no longer be able to shine. The immensely high pressures and temperatures in its interior will slacken. The sun will shrink down to become a dying ember of a star, known as a white dwarf, only a little larger than Earth. Artist’s concept of our sun as a white dwarf. Image via Chandra X-ray Observatory. Bottom line: A study suggests our sun is about the lowest mass star that – at the end of its life – produces a visible, though faint, planetary nebula. What that is … and more on the fate of our sun, here. The University of Manchester (UoM) is a public research university in the city of Manchester, England, formed in 2004 by the merger of the University of Manchester Institute of Science and Technology (renamed in 1966, est. 1956 as Manchester College of Science and Technology) which had its ultimate origins in the Mechanics’ Institute established in the city in 1824 and the Victoria University of Manchester founded by charter in 1904 after the dissolution of the federal Victoria University (which also had members in Leeds and Liverpool), but originating in Owens College, founded in Manchester in 1851. The University of Manchester is regarded as a red brick university, and was a product of the civic university movement of the late 19th century. It formed a constituent part of the federal Victoria University between 1880, when it received its royal charter, and 1903–1904, when it was dissolved. The University of Manchester is ranked 33rd in the world by QS World University Rankings 2015-16. In the 2015 Academic Ranking of World Universities, Manchester is ranked 41st in the world and 5th in the UK. In an employability ranking published by Emerging in 2015, where CEOs and chairmen were asked to select the top universities which they recruited from, Manchester placed 24th in the world and 5th nationally. The Global Employability University Ranking conducted by THE places Manchester at 27th world-wide and 10th in Europe, ahead of academic powerhouses such as Cornell, UPenn and LSE. It is ranked joint 56th in the world and 18th in Europe in the 2015-16 Times Higher Education World University Rankings. In the 2014 Research Excellence Framework, Manchester came fifth in terms of research power and seventeenth for grade point average quality when including specialist institutions. More students try to gain entry to the University of Manchester than to any other university in the country, with more than 55,000 applications for undergraduate courses in 2014 resulting in 6.5 applicants for every place available. According to the 2015 High Fliers Report, Manchester is the most targeted university by the largest number of leading graduate employers in the UK. The university owns and operates major cultural assets such as the Manchester Museum, Whitworth Art Gallery, John Rylands Library and Jodrell Bank Observatory which includes the Grade I listed Lovell Telescope. The latest paper by the scientists, published today in the PNAS, shows that Huntington’s Disease – one of seven major types of age-related dementia – is directly linked to brain urea levels and metabolic processes. 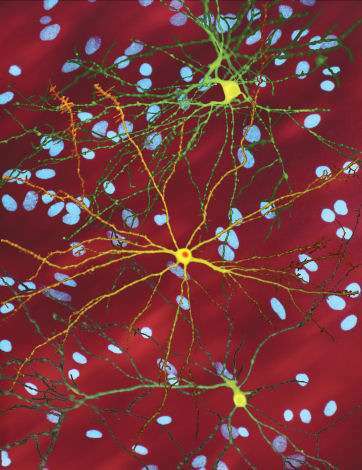 Dementia results in a progressive and irreversible loss of nerve cells and brain functioning, causing loss of memory and cognitive impairments affecting the ability to learn. Currently, there is no cure. The team used human brains, donated by families for medical research, as well as transgenic sheep in Australia. Professor Cooper expresses his thanks to all the families of patients with Huntington’s disease in New Zealand who so generously supported this research through the donation of brain tissue to the Neurological Foundation of New Zealand Douglas Human Brain Bank in the Centre for Brain Research. This work was supported by the CHDI Foundation (A-8247) and Brain Research New Zealand. Other Manchester-based scientists who made important contributions are Dr Stefano Patassini and Dr Jingshu Xu. 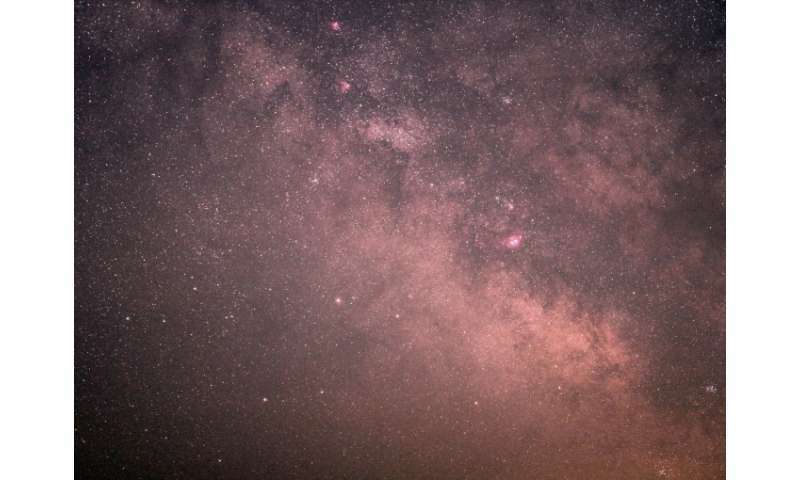 An international team of astronomers led The University of Manchester have found evidence of a new ‘missing-link’ black hole in the Milky Way galaxy, hidden in the Sagittarius constellation. The black hole is located approximately 26,000 light years, or 7.9 Kiloparsecs (kpc), from Earth in a globular cluster called, NGC 6624. A globular cluster is a gravitationally bound swarm of millions of old stars occupying regions that are just a few light years across. The team, led by Dr Benetge Perera, have found evidence that the millisecond pulsar (PSR B1820-30A) – a pulsar is highly magnetized, rapidly rotating neutron star that emits a beam of electromagnetic radiation – in NGC 6624 is most likely orbiting around an intermediate-mass black hole (IMBH) located at the cluster’s centre. The mass of black hole is so big, it is the equivalent to weight of 7,500 of our suns. PSR B1820 30A is the closest-known pulsar to the centre of any globular cluster and it is the first pulsar to be found orbiting a black hole. The detection of IMBHs is extremely important as they can help astronomers understand the ‘missing link’ between stellar mass black holes (SMBH), the smallest kind, and supermassive black holes (SMBH), which are the largest. Dr Perera, from the Jodrell Bank Centre for Astrophysics in the University’s School of Physics and Astronomy, explains: “High stellar densities towards the centre of globular clusters provide a likely environment for the formation of massive black holes. The detection of IMBHs is important for understanding the missing link between the different kinds of black holes. The pulsar was discovered using the Lovell Telescope, based at Jodrell Bank, in 1990. Since then the team has analysed more than 25 years of observations from PSR B1820- 30A made with the telescope. In addition to Jodrell Bank, the analysis included data obtained using the Nançay Radio Telescope in France. Dr Perera added: “We have determined the orbital parameters and the companion mass of PSR B1820-30A from the motion measured through pulsar timing. Simply put, this means our results are consistent with the pulsar being in orbit around a central intermediate-mass black hole. 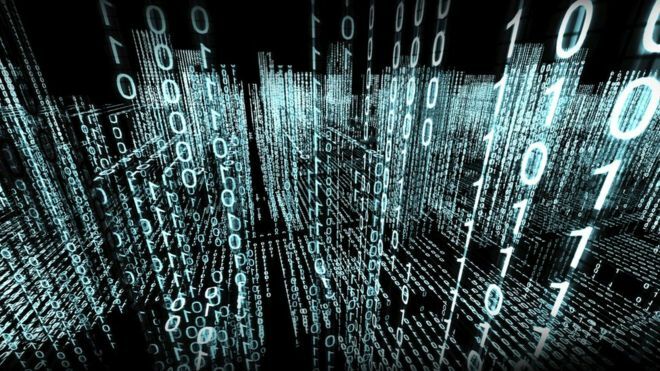 Researchers from The University of Manchester have shown that it is possible to build a new super-fast form of computer that “grows as it computes”. Professor Ross D King and his team have demonstrated for the first time the feasibility of engineering a nondeterministic universal Turing machine (NUTM), and their research is to be published in the prestigious Journal of the Royal Society Interface. The theoretical properties of such a computing machine, including its exponential boost in speed over electronic and quantum computers, have been well understood for many years – but the Manchester breakthrough demonstrates that it is actually possible to physically create a NUTM using DNA molecules. “Imagine a computer is searching a maze and comes to a choice point, one path leading left, the other right,” explained Professor King, from Manchester’s School of Computer Science. “Electronic computers need to choose which path to follow first. “But our new computer doesn’t need to choose, for it can replicate itself and follow both paths at the same time, thus finding the answer faster. “This ‘magical’ property is possible because the computer’s processors are made of DNA rather than silicon chips. All electronic computers have a fixed number of chips. “Quantum computers are an exciting other form of computer, and they can also follow both paths in a maze, but only if the maze has certain symmetries, which greatly limits their use. The University of Manchester is famous for its connection with Alan Turing – the founder of computer science – and for creating the first stored memory electronic computer. “This new research builds on both these pioneering foundations,” added Professor King. Alan Turing’s greatest achievement was inventing the concept of a universal Turing machine (UTM) – a computer that can be programmed to compute anything any other computer can compute. Electronic computers are a form of UTM, but no quantum UTM has yet been built. Scientists from The University of Manchester working on a revolutionary telescope project have harnessed the power of distributed computing from the UK’s GridPP collaboration to tackle one of the Universe’s biggest mysteries – the nature of dark matter and dark energy. 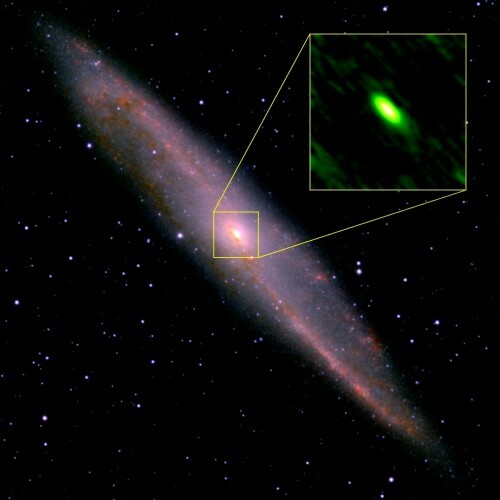 Researchers at The University of Manchester have used resources provided by GridPP – who represent the UK’s contribution to the computing grid used to find the Higgs boson at CERN – to run image processing and machine learning algorithms on thousands of images of galaxies from the international Dark Energy Survey. The Manchester team are part of the collaborative project to build the Large Synoptic Survey Telescope (LSST), a new kind of telescope currently under construction in Chile and designed to conduct a 10-year survey of the dynamic Universe. LSST will be able to map the entire visible sky. In preparation to the LSST starting its revolutionary scanning, a pilot research project has helped researchers detect and map out the cosmic shear seen across the night sky, one of the tell-tale signs of the dark matter and dark energy thought to make up some 95 per cent of what we see in the Universe. This in turn will help prepare for the analysis of the expected 200 petabytes of data the LSST will collect when it starts operating in 2023. The pilot research team based at The Manchester of University was led by Dr Joe Zuntz, a cosmologist originally at Manchester’s Jodrell Bank Observatory and now a researcher at the Royal Observatory in Edinburgh. The LSST will produce images of galaxies in a wide variety of frequency bands of the visible electromagnetic spectrum, with each image giving different information about the galaxy’s nature and history. In times gone by, the measurements needed to determine properties like cosmic shear might have been done by hand, or at least with human-supervised computer processing. With the billions of galaxies expected to be observed by LSST, such approaches are unfeasible. Specialised image processing and machine learning software (Zuntz 2013) has therefore been developed for use with galaxy images from telescopes like LSST and its predecessors. This can be used to produce cosmic shear maps like those shown in the figure below. The challenge then becomes one of processing and managing the data for hundreds of thousands of galaxies and extracting scientific results required by LSST researchers and the wider astrophysics community. As each galaxy is essentially independent of other galaxies in the catalogue, the image processing workflow itself is highly parallelisable. This makes it an ideal problem to tackle with the kind of High-Throughput Computing (HTP) resources and infrastructure offered by GridPP. In many ways, the data from CERN’s Large Hadron Collider particle collision events is like that produced by a digital camera (indeed, pixel-based detectors are used near the interaction points) – and GridPP regularly processes billions of such events as part of the Worldwide LHC Computing Grid (WLCG). A pilot exercise, led by Dr Joe Zuntz while at The University of Manchester and supported by one of the longest serving and most experienced GridPP experts, Senior System Administrator Alessandra Forti, saw the porting of the image analysis workflow to GridPP’s distributed computing infrastructure. Data from the Dark Energy Survey (DES) was used for the pilot. After transferring this data from the US to GridPP Storage Elements, and enabling the LSST Virtual Organisation on a number of GridPP Tier-2 sites, the IM3SHAPE analysis software package (Zuntz, 2013) was tested on local, grid-friendly client machines to ensure smooth running on the grid. Analysis jobs were then submitted and managed using the Ganga software suite, which is able to coordinate the thousands of individual analyses associated with each batch of galaxies. Initial runs were submitted using Ganga to local grid sites, but the pilot progressed to submission to multiple sites via the GridPP DIRAC (Distributed Infrastructure with Remote Agent Control) service. The flexibility of Ganga allows both types of submission, which made the transition from local to distributed running significantly easier. By the end of pilot, Dr Zuntz was able to run the image processing workflow on multiple GridPP sites, regularly submitting thousands of analysis jobs on DES images. Researchers at Manchester and Nottingham universities have come up with a better new material than graphene for electronics applications – Indium Selenide. 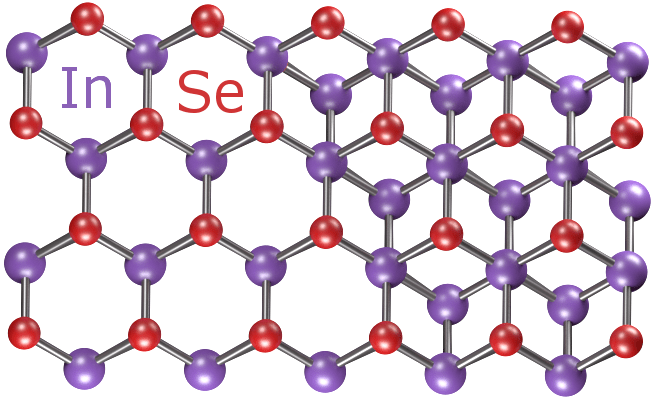 InSe crystals can be made only a few atoms thick and are a better semiconductor than graphene. To avoid atmospheric damage the InSe crystals were grown in an argon atmosphere which allowed atomically-thin films of InSe for the first time. The electron mobility at room temperature was measured at 2,000 cm2/Vs, significantly higher than silicon. This value increases several times at lower temperatures. The researchers believe they can utilise the processes used to produce large-area graphene sheets, to make commercially useful sheets of InSe. A team of astronomers from the University of Manchester, the Max Planck Institute for Radio Astronomy and the University of Bonn have uncovered a hidden stellar birthplace in a nearby spiral galaxy, using a telescope in Chile. The results show that the speed of star formation in the centre of the galaxy – and other galaxies like it – may be much higher than previously thought. The team penetrated the thick dust around the centre of galaxy NGC 4945 using the Atacama Large Millimeter Array (ALMA), a single telescope made up of 66 high precision antennas located 5000 metres above sea level in northern Chile. Astronomers typically look for ultraviolet light or infrared emissions from the brightest, hottest, and bluest stars. The places where stars form are often surrounded by interstellar dust that absorbs the ultraviolet and visible light from the hot blue stars, making it difficult to see where stars are forming. However, the interstellar dust gets warmer when it absorbs light and produces infrared radiation. NGC 4945 is unusual because the interstellar dust is so dense that it even absorbs the infrared light that it produces, meaning that astronomers find it hard to know what is happening in the centre of the galaxy. However, ALMA is able to see through even the thickest interstellar dust.